I haven’t been able to get some of my short trips up on this blog – since I’ve started blogging for the American Geophysical Union at GeoEd Trek, many of my conference experiences are ending up there. But that doesn’t mean I’m still not committed to sharing my professional experiences with students! I recently traveled with a student to a conference, and I absolutely want to share what I’ve learned from attending a non-geology conference (just as valuable as a geology gathering!). This past summer, I had two undergraduate students working with me on a project for the Society of Exploration Geophysicists (SEG). Both students – one a geography major, one a communications major – worked on developing geoscience content pages for the SEG Wiki. It was an excellent experience for all three of us, and I could see the clear dynamic and benefit of having two students from different disciplines work together in taking their existing geoscience content knowledge, learning even more content, and developing effective ways of communicating that on a wiki page. Penn State wrote an article about their work, and you can see the profiles on the SEG Wiki for Mattie Mylonas and Judy Smith. As Mattie is a Communications, Arts & Sciences (CAS) major, we decided that the best opportunity for her to share her work was at the Pennsylvania Communication Association (PCA) 78th Annual Convention, held at the Penn State York campus on October 9-10, 2015. Along with CAS faculty member Dr. Susan Fredricks, the four of us drafted an abstract where Mattie looked at the theory of symbolic interactionism and how that is portrayed through the collaboration and wiki work. 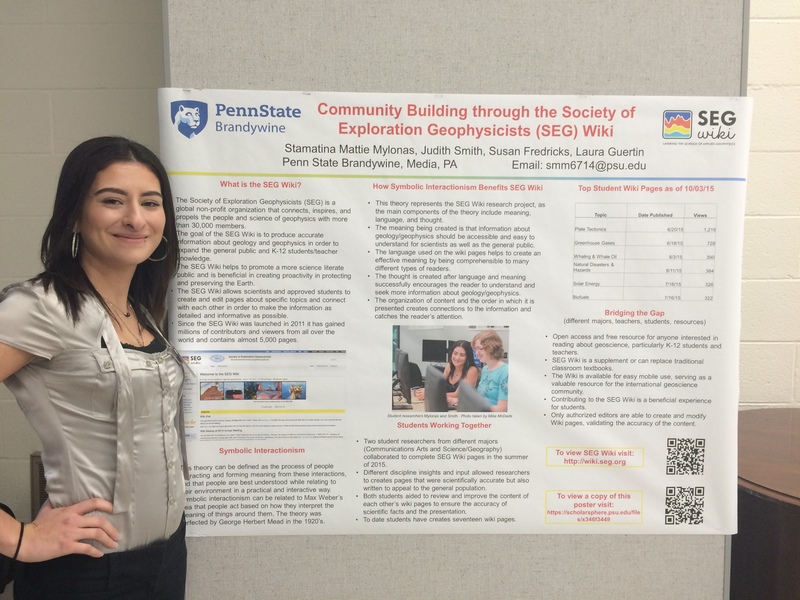 Mattie has her poster uploaded into Penn State’s ScholarSphere, if you are interested in seeing her work! While I was mentoring Mattie on navigating the conference program, thinking about questions she could ask others, and providing her business cards to hand out (which she was very active in doing! ), I was taking in conference sessions myself, thinking about how some of the ideas could relate back to my classes and my own professional development. On the first day, I started the conference by attending a session titled “Translating Research Communication in Action Through Speaking and Listening.” The session shared some fascinating information, ranging from making sense of listening, to listening in terms of how you are oriented in your world, and even how women are listened to in Green Politics. The speakers were former presidents of PCA. I then moved to a session on “Approaches to Assessment in Communication,” and I found this session incredibly informative and helpful when thinking about my own geoscience courses and program. So many of the items discussed were appropriate to any discipline, such as thinking about having courses in a department with outcomes that match the outcomes of the college, listing assessment tools along with outcomes for courses, having every course in a program result in a “product” that can be added to an ePortfolio, etc. Additional sessions included Communication Ethics Praxis in Organizational Contexts, Technological Implications in Changing Environments, Understanding Computer Mediated Technology, and a session where student undergraduate and graduate award winners read their research papers. The format of this conference was different than what we have at geology conferences. Here, the majority of presentations were done in panels of 3-4 people, where the panelists read papers they had written prior to the meeting (they submitted 20-page papers for consideration instead of 500-word abstracts like we do in science). Most people read from their papers, and extremely few utilized PowerPoint slides (only when they had data tables to show). Each panel had a respondent that summarized some of the main points and drew connections between the talks, and then the final 15 minutes of the session was open for Q&A. It was a very different way for me to learn and see how research results are shared. I also took away several interesting new pieces of knowledge. For example, when a nonprofit organization accomplishes its mission, what can/should an organization do? (this was the case with the March of Dimes working towards a cure for polio) It was interesting to think about how organizations must adapt to the needs of the moment, and at times, must broaden their mission statement. And what do organizations do if some of their “community” does not agree with their mission statement? And how do you have a mission statement address the past, present, and future? Another topic… what will be the future of college radio, with a lack of funding and lack of student support and interest? What is the role of citizen journalism, when their stories are objective but many do not contain any sources. And are we encouraging the digital divide when something such as Apply Pay comes out, and “I can have this before anyone else?” And finally (I really liked this one)… when and in what context is it appropriate to embrace technologies, such as taking out a cell phone at the PCA conference? This last one was really fascinating to think about, especially as the conference encouraged tweeting and had a hashtag #PCA2015York, yet I as the geologist did the most tweeting at the conference! I hope I get to attend another communications conference in the future – the wealth of ideas and information I received is something unique and will only help to strengthen my own approaches, program, and way I work with students moving forward. Thank you, PCA!